Pittsburgh, the second city of Pennsylvania in population and importance, county seat of Allegheny co., at the confluence of the Alleghany and Monongahela rivers, which here form the Ohio, 466 m. above Cincinnati, and 250 m. W. by N". of Philadelphia; lat. 40° 26' 34" N, Ion. 80° 2' 38" W.; pop. in 1800, 1,565; in 1810, 4,768; in 1820, 7,248; in 1830, 12,542; in 1840, 21,115; in 1850, 46,601; in 1860, 49,-221; in 1870, 86,076, of whom 2,015 were colored and 27,822 foreigners, including 13,119 natives of Ireland, 8,703 of Germany, 2,838 of England, 1,036 of Wales, and 584 of Scotland. There were 16,182 families and 14,224 dwellings. Of the 29,854 persons 10 years old and upward returned as engaged in occupations, 444 were employed in agriculture, 11,-077 in professional and personal services, 5,963 in trade and transportation, and 12,370 in manufactures, including 2,542 iron and steel workers. 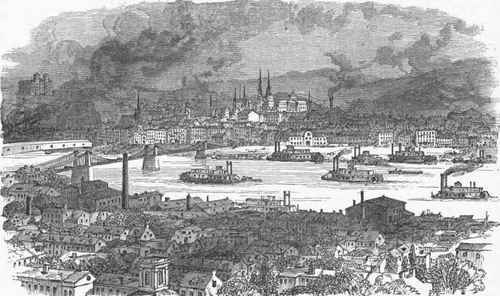 The old city occupied the delta between the Alleghany and Monongahela, to which were annexed in 1872 the boroughs of Allen-town, Birmingham, East Birmingham, Monongahela, Mount Washington, Ormsby, Saint Clair, South Pittsburgh, Temperanceville, Union, and West Pittsburgh, on the S. side of the Monongahela, and in 1874 the township of Wil-kins, adjoining it on the east. These additions in 1870 had an aggregate population of 35,723, raising the population of the consolidated city in that year to 121,799. The population in 1875 is estimated by local authorities at 140,000, and including Allegheny City on the opposite bank of the Alleghany river and other suburbs within 5 m. of the court house, at 210,000. The land between the rivers rises toward the east to a height of from 400 to 500 ft. above the Ohio. The city is substantially and compactly built, and contains many fine residences, particularly in the E. part. A large number of the principal avenues are graded and paved. Among the public buildings are the court house, a solid stone edifice surmounted by a dome; the custom house, a commodious stone structure, which also accommodates the post office and the United States courts; the municipal hall, costing $750,000, with a massive central tower and granite front; the mercantile library, costing $250,000, containing a reading room and having 15,000 volumes; the Roman Catholic cathedral of St. Paul, an imposing edifice of brick, with two spires and a dome over the choir; St. Peter's and Trinity (Episcopal) churches; the first Baptist church; the first and third Presbyterian churches; the United States arsenal; and several large and substantial public school buildings. Allegheny cemetery is handsomely laid out. - The surrounding country abounds in coal and iron.' The extent of .its iron manufactures has given Pittsburgh the appellation of " iron city," while the heavy clouds of smoke that constantly hang over it, produced by burning bituminous coal in all the dwellings and manufacturing establishments, have caused it to be styled the " smoky city." Seven bridges span the Alleghany river, and five the Monongahela. Horse cars run through the principal streets and to the suburbs. The Pennsylvania, the Allegheny Valley, and the Pittsburgh, Washington, and Baltimore railroads afford direct connection with the eastera cities and with at least three fourths of the state of Pennsylvania; the Pittsburgh, Fort Wayne, and Chicago railroad and tributary lines connect the city with the west and northwest; while the Pittsburgh, Cincinnati, and St. Louis line furnishes communication with the southwest. The three rivers afford additional facilities for traffic, regular lines of steamers plying on the Ohio to Cincinnati and other points. Pittsburgh is the great shipping port for coal and coke to points on the Ohio and Mississippi rivers. The quantity of coal received in 1874 was 4,507,175 tons (equivalent to 135,215,250 bushels), of which 2,332,392 came by the Monongahela river, and 2,174,783 by rail; of coke, 1,202,337 tons (equivalent to 72,140,220 bushels), nearly all by rail. The quantity of coal and coke shipped by river was 48,621,000 bushels, viz. : to Louisville, 24,116,-000 bushels; to Cincinnati, 21,004,000; to St. Louis, 1,434,000; to New Orleans, 1,300,000; to five other ports, 767,000. The receipts of produce during the same year were as follows: wheat, 594,094 bushels; barley, 397,294; rye, 131,684; oats, 1,518,994; corn, 516,104; flour, 460,013 barrels; apples, 45,923 barrels; cheese, 53,261 boxes; butter, 10,537 packages; bacon, 345,142 pieces. Pittsburgh is a port of delivery. The number of vessels belonging to the port on June 30, 1874, was 467, with an aggregate tonnage of 104,040, of which 159, tonnage 37,844, were steamers, and 308, tonnage 66,196 barges. The number built during the year ending on that date was 158, with an aggregate tonnage of 33,134, of which 23, tonnage 4,810, were steamers, and 135, tonnage 28,324, barges. The city contains 16 national banks, with an aggregate capital of $9,000,000 and deposits to the amount of more than $11,000,000, the entire resources being $32,842,551 79. The capital of the state banks amounts to $2,735,138, and the deposits to $7,594,160. There are about 20 fire insurance companies. Manufacturing is the leading interest. About one fourth of the pig iron and blooms of the United States is used by the rolling mills of Pittsburgh. There are about 16 rolling mills, and probably 150 minor iron establishments using the product of these mills for the manufacture of all sorts of steam machinery and implements for agricultural and domestic purposes. The quantity of different kinds of iron received in 1874 for the use of the rolling mills was as follows: pig, 426,718 tons; blooms and muck bar, 9,431; ore, 300,278; scrap, 19,030. The annual value of the iron manufactures is about $30,000,000. The manufacture of steel and copper has been carried on for about 20 years. There are now eight steel works, capable of producing annually more than 50,000 tons. Cotton and woollen factories.. . The city is divided into 37 wards, and is governed by a mayor, a select council of 74 members (two from each ward), and a common council of 44 members. It has a police force and an efficient fire department. Water works on a magnificent scale are in course of construction, to cost from $4,000,000 to $6,000,000. The assessed value of property is $172,000,000. The city debt amounts to about $13,000,000, and the real estate owned by the municipality is estimated to be worth about the same sum. The state supreme court for the western district meets here, and two sessions of the United States courts for the western district of Pennsylvania are held here annually. Among the principal charitable institutions are the western Pennsylvania hospital, with a department for the insane at Dixmont, on the Pittsburgh, Fort Wayne, and Chicago railroad; the city general hospital, the homoeopathic hospital and dispensary, the Pittsburgh infirmary, the Pittsburgh free dispensary, the mercy hospital, the home for destitute men and young men's home, the Episcopal church home, the home for destitute women, and the Roman Catholic orphan asylum. The city is divided into 36 school districts, and the public schools are under the control of a board of education consisting of one member from each district. There are 53. school houses, and the schools are graded and include a high school. The number of teachers employed during the year ending Sept. 1, 1874, was 383 (56 male and 327female); number of pupils enrolled, 21,009; average daily attendance, 12,873; value of school property, $1,904,500. The expenditures for the year ending June 1, 1874, amounted to $601,629 19, of which $273,895 08 was for salaries. The Pittsburgh female college (Methodist) is a flourishing institution. The western university of Pennsylvania was founded in 1819. It has a collegiate department, with classical, scientific, and engineering courses, and a preparatory department, with classical and English courses. In 1873-4 the number of instructors was 17; of students, 252, of whom 80 were in the collegiate and 172 in the preparatory department. It has a library of about 2,500 volumes, extensive philosophical and chemical apparatus, and a cabinet containing more than 10,000 specimens in geology, conchology, mineralogy, and zoology. Connected with it is an astronomical observatory in Allegheny City. There are two theatres, an opera house, an academy of music, and several public halls. There are 9 daily (3 German), 1 semi-weekly, and 19 weekly (3 German and 1 Welsh) newspapers published. There are 141 churches and chapels, viz. : 4 African Methodist Episcopal, 8 Baptist, 1 Church of God, 1 Congregational, 1 Cumberland Presbyterian, 2 Disciples', 10 Episcopal, 1 Evangelical Association, 1 German Evangelical, 2 Jewish, 9 Lutheran, 6 Methodist, 21 Methodist Episcopal, 1 New Jerusalem, 16 Presbyterian, 5 Reformed, 2 Reformed Presbyterian, 34 Roman Catholic, 1 Unitarian, 11 United Presbyterian, 1 Universalist, 2 Welsh, and 1 Welsh Cal-yinistic. - The territory in which Pittsburgh is situated was, at the opening of the French and Indian war, claimed by the English under a charter from the crown, strengthened by a treaty with the Iroquois; and the French laid claim on the ground of discovery. In February, 1754, the English began building a stock-, ade at the river junction, but were driven from it in April by a French force under Captain Contrecoeur, who proceeded at once to erect a fort, which he called Duquesne, in honor of the governor of Canada. This fort at once became the great centre of all the military operations of the French in this part of the country, and its commanding position rendered its restoration to the English a matter of the first importance. In 1755 Gen. Braddock, at the head of the largest expedition that had ever crossed the Alleghanies, was sent to recapture it. On July 9 he was met and defeated by the French and Indians at a point on the Mo-nongahela 10 m. above the fort. Twelve of the British soldiers taken prisoners on that occasion were burned by the savages. A force of 800 men under Major Grant was cut to pieces in a second attempt to take the fort, Oct. 15, 1858; but a third, by 6,000 men under Gen. Forbes, Nov. 25, 1758, was successful, the French, disheartened by the failure of several attacks on the advancing army, having abandoned and set fire to it on the day preceding. A new and large fort was completed about January, 1759, and was called Fort Pitt, in honor of the British minister. Several expeditions were fitted out against it by the French, but they all failed. In 1764 the first efforts were made toward building a town. In October, 1772, the post was abandoned by the English. A controversy between Pennsylvania and Virginia as to the boundary line was the subject of much negotiation, and gave rise to ill feeling between the two states, Virginia claiming the territory on which the city stands under a charter from James I., and Pennsylvania under a charter from Charles II. A company of Virginians took possession of the fort under an order from the Virginia convention, Aug. 11, 1775. On Aug. 31,1779, commissioners appointed by the two provinces met in Baltimore, and agreed upon the boundary, which was duly ratified by their respective legislatures. During the excise troubles of 1791-'4, which culminated in the " whiskey insurrection," Pittsburgh was the scene of much violence. It was incorporated as a borough in 1804, and chartered as a city in 1816. In 1845 a conflagration destroyed the entire business quarter, consuming $5,000,000 worth of property.